The Bower 0.16x Ultra-Wide Fisheye Lens is an ultra-wide angle add-on lens that attaches to the front of your existing lens with a 58mm filter thread. 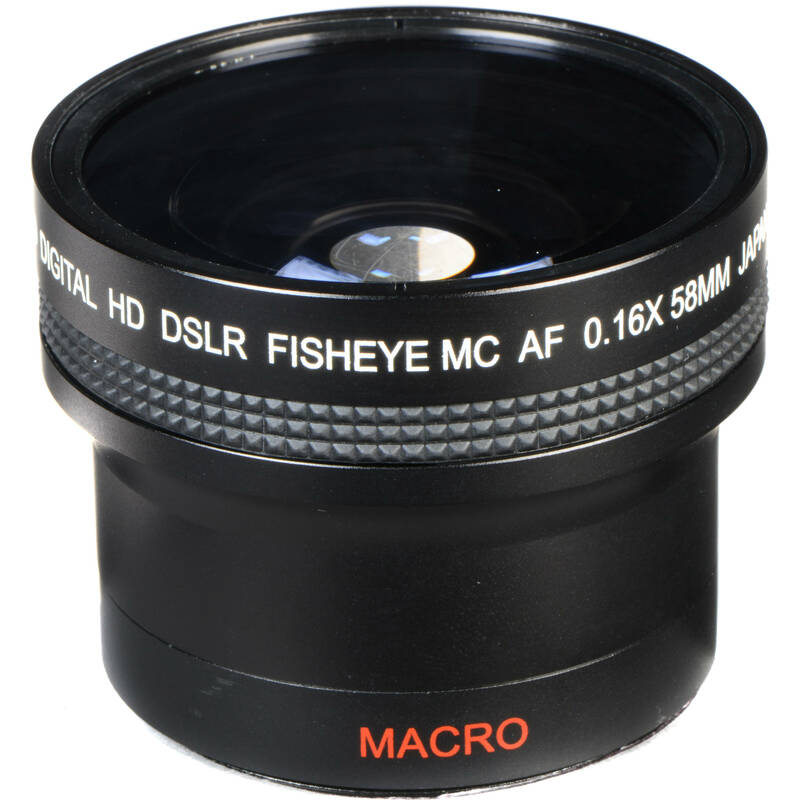 Using this "auxiliary" fisheye lens is an affordable way to expand the capabilities of your current lens and is particularly useful for unusual closeups and panoramic landscapes. This lens is supplied with 52-58mm, 62-58mm, and 67-58mm adapter rings so you can fit your fisheye to a variety of your existing lenses. Box Dimensions (LxWxH) 3.7 x 3.6 x 3.5"
VLB1658 0.16x Ultra-Wide Fisheye Lens (58mm Thread, Black) is rated 4.2 out of 5 by 38. Rated 4 out of 5 by Scott from Awesome I bought this add on so my daughter could experiment with her new love of photography. She now feels I am hogging the lens and wants more camera time. For the cost this is truly a great attachment. Yes the same limitations typical of add-on elements are there (front weight, prone to blur if not threaded properly, etc) but the final pictures are really amazing. For the HUNDREDS OF DOLLARS in savings and the fabulous quality of the image I cant think of why I wouldn't buy this lens again if I had to do it over. TIP: due to extra weight focus in manual to avoid overworking servos in auto-focus lens. They just weren't made to handle that much weight. Rated 4 out of 5 by R Guy from Great add-on Fisheye/ Macro I attach the Bower fisheye lens to my Tamron 17-50mm f/2.8. The lens has good construction it came with a carrying pouch and some adaptor rings so I don't need to pay extra. It's also a macro I actually spend more time taking pictures with only the macro adaptor. Fisheye: Soft and blurry at the edges Macro: With the Tamron 17-50mm my camera can't focus past 40mm. Pictures are very sharp at center, but blurry at the edges (I like the effect) with heavy chromatic aberration. I have already recommended this lens to a few friends. Get it and have fun before you save enough for a real fisheye and a 1:1 macro lens! Rated 5 out of 5 by Anonymous from Does what is says. I added it to my Nikon d5100 standard lens. It makes a big difference when taking photos in a house, it really opens up the room. I attached photos for you to see. I liked it so much that I purchased another one for my Mom. Great lens! Rated 3 out of 5 by Keithy B. from Good fun, but not for serious work It's nice and solidly built (I would give up some of the solidness for a lighter weight), but as would be expected in this price range, the optics leave much to be desired; clarity drops off very quickly from the center. Still, if you know what you're getting beforehand, it's a fun little toy to mess around with, and comes with some adapter rings to boot. Rated 4 out of 5 by thephantomhennes from Good Value I was happy with this adaptor when it arrived. ... The adapter makes your 18-55 kit lens a VERY wide fisheye. Mostly good for fun as the quality does suffer a bit through this lens adapter. But for the price, great fun, and great value. Rated 4 out of 5 by dochenderson from Good Fisheye for the Money Purchased this fisheye to use on a Panasonic FZ30 which has a zoom lens of 35-420. The 35 just wasn't wide enough on some occasions.Did lots of research on the Raynox wide angle and others out there but decided to go with the Bower fisheye because I could essentially get 3 lens in one-- the wide angle, fisheye, and macro--- and if I didn't like it I could return it and get the Raynox which was twice the money. I have a macro on my camera which as it turns out is almost as close as the macro on the Bower. The fisheye works great for the money as does the wide angle capability. I have to use a step-up ring (3 included but not the size I needed) and my main complaint is that the back lens cap threads onto the lens and will not fit onto the lens with the step-up ring attached. Kind of a pain to take the ring off each time. And, the plastic front lens cap is a little too snug to get on and off. As with other reviews, the lens is heavy but I didn't have any problem steadying the camera. For the money, I'd buy it again. Rated 5 out of 5 by N. Pham from Impressive quality and sharpness This lens is quite a gem... it's a cheap gem, but a gem nonetheless. A lot of people like to talk about build quality. Well, frankly, this is a pretty solid lens. I like how it feels: cold and sturdy. I have a Lensmate adapter, which I believe is machine aluminum. The finish and feel of this metal Bower lens matches the Lensmate adapter pretty closely, if not perfectly. It adds weight, but I appreciate that. With the adapter and lens attached, attaching a 430EX to the hotshoe feels balanced. I'm very happy about that. I haven't taken the lens on an outing yet... and I'm not even sure what I'll use it for. However, I think I'll have fun with the lens. It seems fairly sharp throughout. I haven't looked to see how much image degradation there is, but on screen it looks pretty good. Definitely usable on the web and probably usable up to at least 8x12 on print. The best part about this lens is that it is so wide. I am a DSLR user and my widest is 16mm on a full frame. I don't have a fisheye lens, but I can't justify the expense of a fisheye for my DSLR. I saw other WA lenses for my Canon G series Powershot, but this one was the widest and with the most good reviews. The few sample shots posted seem to beat the other lens samples on BHPhoto, so I went with this. Other lenses seem to get soft around the edges. This lens is not immune from soft edges, but the fall off is much less abrupt or pronounced. No regrets, whatsoever. Rated 4 out of 5 by Anonymous from Fisheye good for the Price I haven't used it a lot yet but the lens performs as advertised on my G12. Vignettes when zoomed wide angle as expected. Zoom in a little and it goes away and still is very wide. I have a 35mm DX lens and a nikon d5200 camera - if i use this add on what would be the focal length? so confused. 35mm X 0.16 = 5.6mm with Fisheye distortion....fairly similar to an actual 8mm Fisheye lens on that camera.